Methods have been developed over the last several months which appear to confirm the existence of extraordinary levels of barium within our atmosphere. Barium is a highly toxic substance, and the concentration levels that are a hazard are on par with arsenic (1). The methods developed are simple to duplicate, and they can be performed by anyone with sufficient desire. Any results or conclusions herein will be modified as appropriate and as may be reached through additional research. I am not a chemist by profession, however, all actions recorded have been executed in good faith and to the best of my ability. The participation of independent professionals and researchers is again called for to substantiate or refute the current endeavors, as the consequences of these findings, if confirmed, pose significant health risks to the public at large. The presence of barium as well as other metallic particulates has now repeatedly been demonstrated through a variety of testing methods in direct association with the aircraft aerosol operations that have been conducted over the nation and globe for more than 3 years. Significant benefits of the current method, if confirmed, include simplicity, cost, accessibility and the creation of a chemical sample for positive identification. This method, therefore, has the potential of providing a simple and verifiable method to provide further evidence of criminal operations that continue to be conducted without informed consent. Earlier research has been presented which introduces an inexpensive method of filtration of the atmosphere (2). This method, which involves little more than a box fan and a high quality furnace air filter, has been found to significantly improve the quality of air within an indoor environment as well as to provide commensurate benefits in respiratory health. This filtration system is by no means intended as a substitute for a HEPA filter, but cost and accessibility have been offered as motivating factors. Collection of air samples by this filter method have been conducted for several months, and it is appropriate to present the results at this time since the results appear to be repeatable without difficulty. Approximately 6 weeks are required for each filter sample, and three such tests have now been made. The first sample involved indoor air filtration, and results on that test have been delayed until similar tests could be made with an outdoor filter. The process has now also been completed, and the results are of significant enough concern to warrant their presentation. 1. Construct the air filtration system as described earlier (2). 2. Operate the fan/filter on a low setting for approximately 6 weeks indoors; approximately 4 weeks outdoors. Higher speed settings are likely to force separation of the filter material from the box fan as the material density increases over time. Light through the filter becomes visibly blocked when the material is dense enough for chemical sampling or for filter replacement. Indoor sampling appears to yield higher material volume than outdoor sampling under the tests that have been conducted thus far. size is approx. 5 microns. Please also refer to Inexpensive Air Filtration. 3. A wide mouth clean glass container is filled with approximately 150ml (~½ cup) of distilled water. 4. The filter material is cut into approximately 5cm (~2 inch) squares with scissors. 5. Each square of filter material is placed lightly into the distilled water, and allowed to slowly absorb the water. The higher quality furnace filter material (Manufacturer:Purity) acts very similar to a sponge in its behavior, and eventually will absorb numerous times its own weight in water. 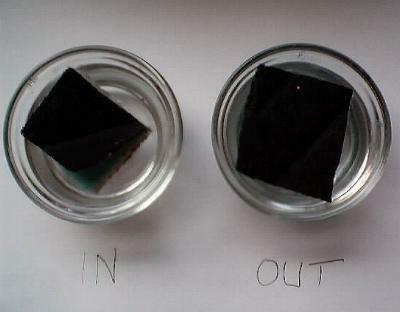 After the filter square has absorbed sufficient water, it is squeezed back into the original distilled water sample. Filter square (approx. 2″ sq.) placed lightly into distilled water. Glass container on left refers to indoor air filter solution under analysis. Glass container on right refers to outdoor air filter solution under analysis. of particulate matter. Backing material of filter visible from top view. 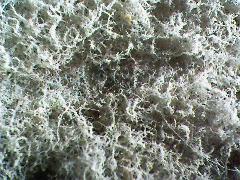 Filter backing material not permitted to absorb water. 6. The above process is repeated for all squares until the water is sufficiently cloudy to support further testing. In the tests that have been conducted thus far, approximately 14 sq. in. has been used for each distilled water sample, i.e., approximately 7 squares. 7. Essentially what is being accomplished in steps 3 through 6 is that a solution of the particulates being found in our current atmosphere is being created. Some of these particulates (or aerosols) are expected to be soluble and others insoluble. It has been noticed that the outdoor sample solution readily makes visible sand and dirt (large particulates) at the bottom of the solution. The indoor sample solution usually has more fibrous material present, due to the presence of a clothes dryer and carpet. These inert materials are not relevant to the current examination and are to be dismissed from further consideration; the emphasis herein is upon the soluble particulates (aerosols) as will be seen shortly. 8. 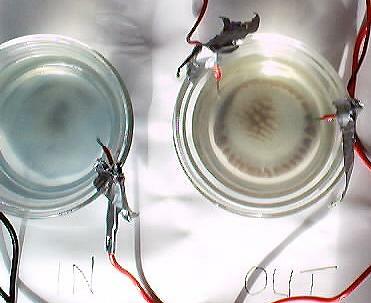 The solution is then subjected to electrolysis. A six-volt lantern battery with copper electrodes has primarily been used for the tests. Other electrodes, including aluminum and silver, have also been used for comparison purposes. Although there does appear to be some interaction of the electrodes (as expected) with the solution, it appears to be tangential to the primary results which are being obtained. Copper electrodes are relatively inert in the reaction, and they are readily available to the public for additional testing. If an ammeter is connected into the circuit, the readings appear to range between approximately 6-12 milliamps. The expected chemistry of the electrolytic reaction will also be discussed in greater detail at a later point. 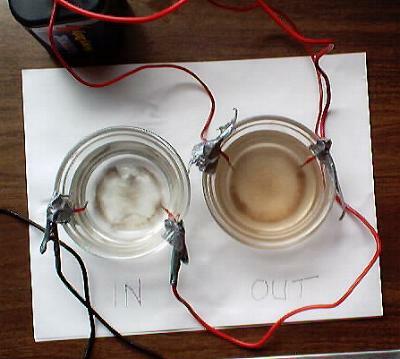 The electrolysis involves nothing more than hooking up a couple of copper electrodes to the lantern battery, placing them into solution on opposite ends of the container (diam. used approximately 2.5in.) and allowing adequate time for the reaction to occur. Indoor (left) and outdoor (right) solutions at the beginning of the electrolytic process. Extremely large particulate matter is visible in both solutions. The outdoor solution contains considerable dust and sand; the indoor solution contains more fibrous material from domestic sources. The visible large particulates and solid materials are not the primary target of this research; the emphasis within is upon extremely fine non-visible particulates and ions that are in solution. Tape is used to hold the electrodes in position. 9. 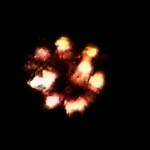 It will appear at first glance that little to no chemical reaction is occurring. Closer examination with adequate lighting and a magnifying glass will reveal that an electrolytic reaction is occurring. Small amounts of gas will be released from the negative electrode. Distilled water by itself is expected to provide little to no reaction electrolytically due to the absence of salts or other solutes. The fact that the reaction is occurring does by itself indicate the presence of solutes from the filter material which in turn originates from atmospheric particulates or aerosols. Approximately 2 hours into the electrolysis reaction. to be slightly visible at this time, especially on the indoor filter solution. 10. 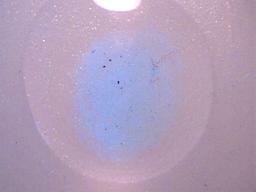 With adequate lighting and magnification a white precipitate may be seen forming shortly after the electrolysis is commenced. It is common for the solution to turn visibly whitish after a few hours of electrolysis. Over the next 24 hours or so the precipitate will continue to accumulate, and with copper electrodes will take on a bluish color. The precipitate is of a whitish color in origin, clearly insoluble in water, and takes a tint from the electrodes used over extended time. It is common for a layer of precipitate approximately 1/32 in. thick to form at the bottom of the container when the reaction is complete. Approximately 6 hours into the electrolysis reaction. 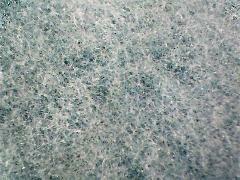 The outdoor filter solution is now also beginning to show the whitish cast from the precipitate being formed. The indoor filter solution subsequently begins to take on a blue hue, presumably from the influence of the copper electrodes. 11. Approximately 24-48 hours is required for the reaction to complete. What has been found repeatedly with all tests being conducted is the presence of an insoluble precipitate forming as a result of the electrolysis. The focus of this discussion is the precipitate and its subsequent identification to the best of my ability at this time. Approximately 36 hours into the electrolysis process. At this point, substantial insoluble precipitate has formed and collected at the bottom of the glass container. The sand collected from the outdoor filter remains separate and visible at the bottom of the container on the right. The appearance, form and nature of the precipitate at the microscopic level remain constant regardless of the type of electrode used. Aluminum electrodes give an orange or tan cast to the precipitate, but the solubility tests remain constant regardless of the electrodes used. 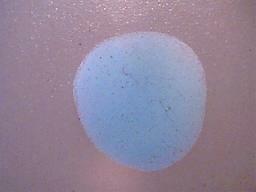 Appearance of the precipitate under the microscope as a fine powder form remains constant as well. 12. The best analysis and identification of the precipitate being formed that I am able to make thus far is that the precipitate appears to be barium sulfate. The amount of precipitate that is being formed would indicate that large numbers of barium ions are in solution as a result of the method that has been developed. If confirmed, this finding represents a potentially significant health risk to the public. Approximately 48 hours into the electrolysis process. 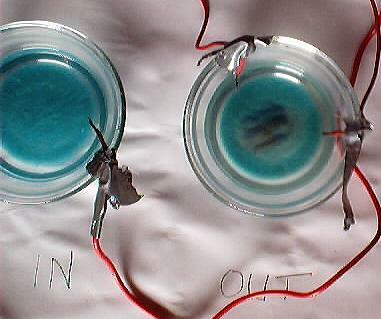 Photograph to show the use of the 6 volt battery. At this point a definite layer of approximately 1/32 inch of insoluble precipitate exists. The distilled water will again become quite clear when the reaction is complete. The precipitate formed is highly insoluble in water. The precipitate can then be subjected to further examination under the microscope as well as the solubility tests. This paper will now continue to elaborate on the processes, deductions, analyses and conclusions that have been made above. The next question that arises is, given the above set of particulates or aerosols in combination with the set of metallic elements that have previously been identified with rainwater samples via EPA protocols, what would cause the particulate matter collected in the air filter to form a white precipitate under electrolysis? The requirement for the above is that the particulate matter in solution needs to serve as an electrolyte. This means that there must be ions in solution, and from the amount of precipitate that is forming, one would expect an abundance of ions in solution. In accordance with the above chart, please refer to a statement by Peter Hobbs, Introduction to Atmospheric Chemistry (6), on page 94 regarding the percentage of the aerosols in the atmosphere that are from airborne sulfate produced by SO2 emission oxidations. Sulphates are produced commonly from incomplete combustion processes, and are one of the most abundant sources of pollution in the atmosphere. In addition, since copper electrodes are being used in the reaction, it would be wise to include this element as a candidate of consideration. It is of interest to note that of all the elements or compounds listed, only the sulphates commonly exist as a negative ion. The next question to impose upon the above compounds is whether or not they are water soluble or not. 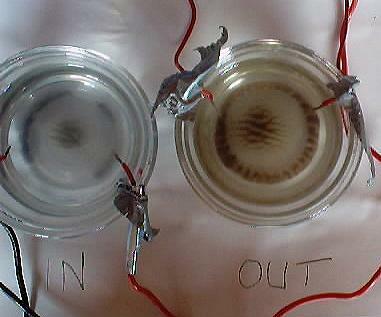 An important characteristic of the precipitate being formed under electrolysis is that it is highly insoluble in water. Let us next examine the case of CaSO4, calcium sulphate. Calcium sulphate is stated within the Handbook to be slightly soluble in water (.2gms/100gms H2O). In addition, calcium as a solid reacts quite quickly with cold water to give a milky suspension of calcium hydroxide, some of which dissolves. No such milky spontaneous reaction has been observed with the precipitate that has been formed as a result of electrolysis. In addition, calcium sulphate is commonly available as Plaster of Paris. Solubility tests with water have also been conducted with calcium sulphate (Plaster of Paris) for comparison purposes. The solubility of this test was in complete agreement with what has just been stated above. Solubility is slight, visible and of a milky appearance. This eliminates CaSO4 (calcium sulphate) as a further candidate due to its failure with these initial solubility tests using water alone. Let us next examine the case of Ti2(SO4)3 (titanium(+3)sulphate). Within the Handbook, Ti2(SO4)3 (titanium(+3)sulphate) is listed as being soluble in dilute hydrochloric acid (HCl). 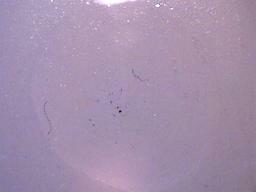 The precipitate under examination formed by electrolysis fails this test. The precipitate under examination is insoluble in dilute hydrochloric acid (HCl), by direct testing. 1. The precipitate must be insoluble in water (H2O). As a matter of fact, it must be highly insoluble in water as barium sulphate is commonly used in gastro-intestinal x-ray examinations. Soluble forms of barium are highly toxic. It is only the high level of insolubility of barium sulphate that permits it to be ingested without harm for medical use. 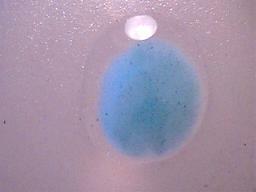 The dried precipitate in its original form on a microscope slide. The dried precipitate subjected to distilled water. 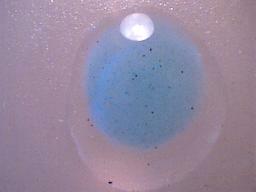 The outline of the drop of water is visible surrounding the precipitate. The precipitate is clearly insoluble in water. The light spot at the top of the microphotograph is a reflection of light. 2. The precipitate formed must be insoluble in ethanol. The dried precipitate subjected to ethanol. No evidence of solubility of any kind. Ethanol evaporates rapidly, and as a consequence the outline of the drop of ethanol can no longer be seen. 3. The precipitate formed must be insoluble in dilute hydrochloric acid. The dried precipitate subjected to dilute hydrochloric acid (HCl). The outline of the drop of hydrochloric acid is visible surrounding the precipitate. Insoluble. Light reflection at top of microphotograph. 4. The precipitate formed must be mildly soluble in dilute sulfuric acid (H2SO4). The dried precipitate subjected to dilute sulfuric acid (H2SO4). 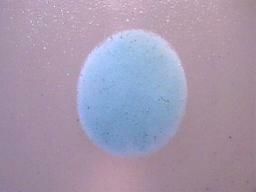 The outline of the drop of sulfuric acid is visible surrounding the precipitate. Within minutes, evidence of solubility appears as precipitate begins to become more diffuse. Elapsed time approx. 1/2 hour. Solubility process continues. Elapsed time approx. 1 hour. Solubility process essentially complete. The precipitate that has been formed passes all of the above tests by direct testing and by observation under the microscope. The identification of the precipitate as being that of barium sulphate remains valid with the information available within this discussion. As one final point of analysis, it is worthwhile to reintroduce the subject of electrolysis into the analysis. A valid question is to ask, why is electrolysis important for this particular reaction to take place? 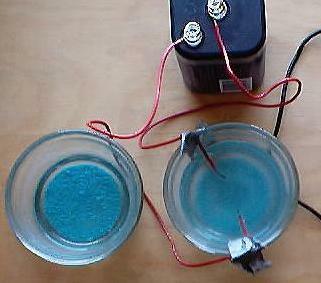 Under what conditions is electrolysis required to produce a chemical reaction? Some chemical reactions occur spontaneously, others do not. Whether or not the reaction occurs spontaneously or not is another important characteristic to consider in the identification of any compounds that are formed. If a reaction does not occur spontaneously, it is sometime possible to provide additional energy in the form of electrolysis to allow the reaction to occur. This is what makes electrolysis such an important commercial process, as it produces many reactions which would otherwise not occur. In the case of the precipitate being formed, it is also a worthwhile question to ask whether or not the reaction of Ba(+2) and SO4(-2) ions to form barium sulphate (BaSO4) is spontaneous or not. If it were a spontaneous reaction, we would have to carefully reconsider any assessments that have been made thus far. If it were a spontaneous reaction, one would logically expect the precipitate to be forming spontaneously within rainwater samples, and this is clearly not the case. It can be stated that “sulfur is one of the least active non metals at ordinary temperatures”(5). It is therefore to be expected that the reaction is not spontaneous, as has been observed, and that it does require the supplying of additional energy (electrolysis). In addition, an examination of the oxidation-reduction potentials of this reaction also indicate non-spontaneity in the reaction. Ba(+2) + SO4(-2) -> BaSO4(s) where (s) refers to a solid form. The assessment provided within this paper therefore remains current and valid, and the best identification that I am able to make of the precipitate being formed exists as barium sulphate. These findings, if confirmed, should present the gravest of concerns to all citizens of this nation and globe. (1) Handbook of Mathematical, Scientific and Engineering Formulas, Tables, Functions, Graphs, Transforms. Limits for Human Exposure to Air Contaminants, 1997, by Staff of Research and Education Association.